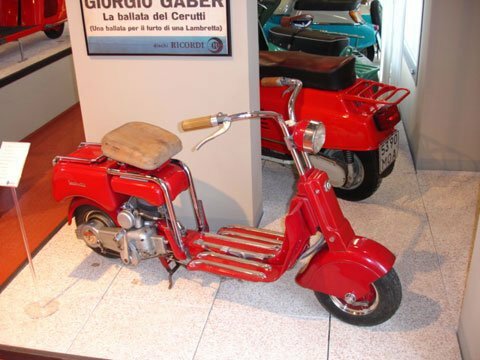 The scooter that started it all off Innocenti, left the production line in Milan in October 1947th At the end of its production in October 1948 in all 9,669 machines had been built. Overall, the machine was both economical and fast (40-45 km / h). He was radical in its design, but easy to use. The frame was a tubular design and consisted of two sections. 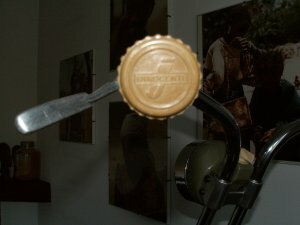 The front consists of a section of pressed steel head attached to the steering head, which kept the fork. The rear section consisted of two chrome pipes around the fuel tank and connected to a toolbox of pressed steel. 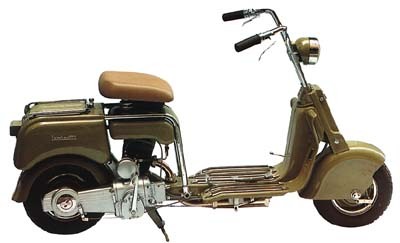 The 123cc engine is directly air-cooled and shaft drive. 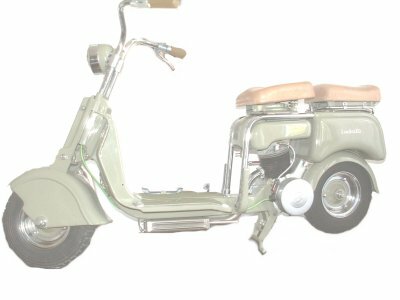 The gearbox has been a 3-speed that was led off by a rod mechanism, a system that was dropped on all subsequent Lambretta. The suspension was extremely limited, consisting of nothing behind the scooter and only two shrubs in the front fork. All cables are housed inside the frame, while the look very clean and tidy, does not help when you need to change a broken cable. A very interesting feature of the model A, which was dropped in later models, a cup of oil was very useful to measure integrated into the fuel tank cap. The ceiling itself was green plastic, but had a metal insert, so you can measure the exact amount of oil required every time you meet. Stop the power came in the form of drum brakes that had cast iron brake shoes and friction material lining the drum itself. Innocenti all their models constantly updated and refined their scooters. A model actually took place in three versions, if you take into account all significant changes in its production. A model is available in six colors are gray, blue, green, beige, red and brown, which was a pastel color. It is believed that the colors we have places like old military factories and other sources that had plenty of paint left by the war. 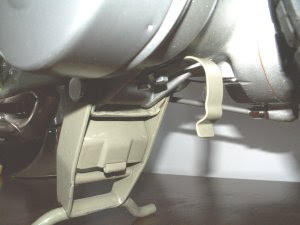 Since its launch, the Model A comes with a stamped steel plate as the seat base, covered with a light brown leather. 7-inch chrome rims wheels three nuts on the front and three in the back, which are also required from the rim to the hub, causing a minor problem when it came to change the tires because the tires should be left with to do so. The cover of the steering wheel on the first drafts were painted the same color as the body. The horn is a mechanic and was operated by a pedal near the floor. The stand was also "mechanical" he had to lift when taking the bike off its stand, so when the horse A, the bracket is held in place with a clip at the bottom of the chassis. 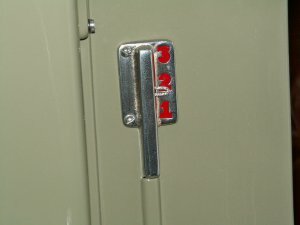 The attention to detail was one of Mr. Innocenti is a major concern on his Lambretta, with details such as the lock for lunch also included a switch, the key to the position of the scooter would be when the key was removed, stopped the scooter. The foot pedal speed offset (the only one with this Lambretta) + and - pedals were consistent with each other, also bid on a license plate holder, although at that time in Italy, the law requires no license plates. 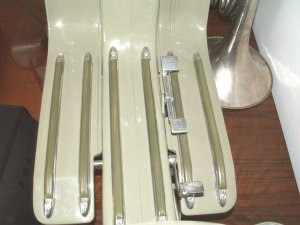 Later versions or another had a return spring on the stand, which was now thrown together rather than welded to the destination than the first version. It can only be done, that the problems occurred in the wheels and hubs, or the designers came up with a better method for the rear hub in this six-wheel nuts. Three bolts and nuts will hold the rim halves together, while three others held on the wheel hub. The front has remained the same, however, only three clips holding together the entire assembly. Other updates were again lunch is no longer inserted in the ignition inside the Killswitch button was placed in a hole that was previously held by the mechanical lever Horn. Horn has been replaced by the mechanical power, or the flywheel magneto cover was painted in silver and circles. Rear license plate bracket was also abandoned, as above, do not need time in Italy. Small changes at the end of the production cycle were mainly in the seat. This is now a curved base is also adjustable for anchoring the vinyl cover was brown. In Italy, the material is called PEGAMOIDES, a plastic material and tight. The support was built alloy seat now. Finally, the foot instead of alloy, was not made of cast iron. Overall, Model A, even though she got a slow start was an overall success. Due to high, production and attention to detail Innocenti never recovered costs in a model that really lost money rather heavy. Demand is strong for the new scooter, and Innocenti was convinced that if the figure could increase production, profits would follow.